We all have a natural curiosity about our past. It’s a universal trait in historical organizations such as ours. We are all enthralled and absorbed with reminiscences of the “Lost Cause”, and the impact that this watershed event had on our American culture. We all enjoy pondering how things might have been, if only a few things were changed. For instance: What if, “Stonewall” Jackson would have been at Gettysburg; or, what if....Captain Nathaniel Lyon would have stayed in Kansas where he belonged; or as Hank Williams Jr. wails..“If the South Would’a won we’d have it made!” All of these...”what ifs” are interesting to contemplate, however history is written by “what was”....not “what if”. Occasionally we like to hear of a real Southern success story. The history of Sterling Price Camp #145, of the Sons of Confederate Veterans is a success story of the first order. It has been (and continues to be) a story of endurance and achievement, in the face of unrelenting adversity. For the past 100 years we have been a purely patriotic organization, that has taken justifiable pride in our Confederate ancestors, the men and women of the South, who sacrificed their all for the cause they believed in. Camp #145 is the oldest Sons of Confederate Veterans Camp in continuous existence west of the Mississippi River, and the second oldest camp in the entire Confederacy. None of this would have been possible without the leadership and dedication of a group of men in St. Louis. Men such as Richard Brownrigg Haughton, Seymour Stewart, Walter Scott Hancock, and Thomas Powe...all of whom went on to become Commanders-in-Chief of the National organization of the Sons of Confederate Veterans. Their legacy is one in which we can take justifiable pride. It is important to put this success story into a historical perspective, and to understand that minor fluctuations in membership levels, or in degrees of participation are normal. Just as the pendulum of time swings to and fro, so too will periods of intense activity be followed by lulls of creative inactivity. Good leadership can bring out the best of both of these times. The important thing is that we never loose sight of our common goal.....the vindication of the Confederate cause. The interpretation of just what the “Confederate Cause” means, quite often falls victim to “popular culture”. “Pop culture”includes those fleeting attitudes created by media manipulators, and others whose agenda takes priority over truth. Popular attitudes have had a definite influence on membership levels since veterans organizations were established. They effect not only how society views patriotic groups (such as ours), but also how we see our role within the Sons of Confederate Veterans. As awful and biased as they are, productions such as:”Ken Burns Civil War Series”, or “Gettysburg”, or even “Glory”, do have a tendency to peak interest in that period of history, and quite often stimulate membership in the SCV. Other “Pop Culture” movements that have been created by those with a “neo-reconstructionist” agenda, have often had a less desirable effect. Since the 1960's there has been a revival in anti-Confederate hate groups. These powerful, bigoted organizations will settle for nothing less than the complete annihilation of all Southern culture and traditions. They have twisted history to fit their agenda, and presented these distortions to the public as gospel. Never, since the dark days of reconstruction, has a more concerted effort been made to eradicate our heritage, and replace it with an alien, un-American culture. Not since that “Tragic Era”, has it been more “unpopular” to espouse traditional Southern beliefs; beliefs in religious ethics, constitutional principles, or individual self-determination and responsibility. This is the adversary we have faced for the past 100 years, and have conquered time and time again. We will continue to emerge victorious for the next 100 years also. Our original Camp motto..”To Keep Straight in History, The Record of Their Words and Deeds”is for time immemorial. When we look at the devastation of the South caused by the war,( as in the photos of post-war Atlanta or Charleston), and consider the homes destroyed, loved ones killed, and lives ruined, its no wonder that veterans for the next thirty years didn’t want to recall the horror of war. Martial law outlawed ex-Confederate organizations til 1877, but the Grand Army of the Republic (the yankee veterans group) ruled the country with an iron hand til the late 1800,s. Until the election of Grover Cleveland in 1884 , all presidents since Lincoln were members of the GAR. With Cleveland’s election there came a lessening of restrictions imposed against the South; Confederate battle flags were returned to the states, ex-Confederate Officers were appointed to his cabinet, and Confederate Veteran organizations began to flourish. Near the turn of the century it became apparent that the old veterans (many in their 70's by now) were dying out. With their passing, the organization built to uphold the Confederate soldier’s good name and virtuous cause would pass into obscurity also. It was determined by the sons of these soldiers that this would not happen. On July 7th 1899 Sterling Price Camp #145 of the United Sons of Confederate Veterans was organized. On July 12th it was chartered by nine members: Walter Scott Hancock, Richard Brownrigg Haughton, Lee Meriwether, Harry B. Hawes, Thomas E. Powe, Dr. Floyd Stewart, Seymour Stewart, Joseph W. Folk, and James A. Seddon. Walter Scott Hancock was elected Camp Commander. As an aside, Joseph Wingate Folk went on to become Governor of Missouri in 1904, and Judge James Alexander Seddon was the son of James A. Seddon ,Confederate Secretary of War. And as stated before: Hancock, Haughton, Powe, and Seymour Stewart went on to become Commanders-in-Chief of the Sons of Confederate Veterans. It was a very distinguished and talented group of people who originated our Camp. Records from the time period from 1899 til 1932, were gleaned from the pages of the old Confederate Veteran Magazine, and they are sketchy at best. There are some “lost” years in our history. Past Commanders and Adjutants have often neglected to transfer the various Camp records, banners, and other Camp property to their successors. It may be that these vital records are moldering away in some attic or basement. Some, I am sure, are hidden in an archive yet discovered. The net result is that our Camp history is an ongoing work in progress, that will be updated as the records are found. There are many gaps in the research that remain unanswered, and only time, hard work and a lot of luck will fill them. Records from the period from 1932 til 1987 were provided through the research efforts of Commanders Patrick Hardy and Oliver Sappington. Their results were graciously contributed to this work. They had both compiled a considerable amount of material from various sources. It is hoped that by making these records available, that future Camp historians will have a foundation to build on in our next 100 years. In 1987 there was a renewed effort in the State of Missouri to regain our “Division” status that had been lost during the 1940's when we dropped below the required five Camps. With this in mind, on June 27th 1987, representatives from the five Missouri Camps met in Jefferson City, Missouri to reactivate the Missouri Division. Trans-Mississippi Department Commander Edward Overton Cailleteau presided over the ceremonies, and Gaylord Patrick O’Connor was duly elected Division Commander. “Pat” O’Connor had been serving as Commander of Sterling Price Camp at this time. With his election as Missouri Division Commander, Compatriot John Karel became the new Camp Commander, and the “modern era” of our Camp history unfolded. We have been blessed throughout the years with a gracious and gifted set of gentlemen who have contributed their time and talents to the advancement of our Camp. Many of the most prominent St. Louisans have served as Commander of Sterling Price Camp. Charter member Lee Meriwether was one of the most colorful characters in St. Louis history. His father, Minor Meriwether, was a Confederate Engineering Officer who helped plan and construct the fortifications around Vicksburg. He later worked to rebuild the shattered Southern railroads. After the war, while living in Memphis, he clashed with ex-Confederate General Nathan Bedford Forrest. This was not a good situation to be in. General Forrest was worshiped by his men, and feared by all who might cross him. Forrest was president of the Memphis railroad, and Meriwether (in his capacity as City Engineer) had just condemned a section of roadbed that was unsafe. Forrest swore that he would kill Meriwether if he showed his face at the next stock-holders meeting. Meriwether was there...armed to the teeth....and confronted General Forrest. Forrest folded his arms, and looked at the ceiling til Meriwether was finished with his report. 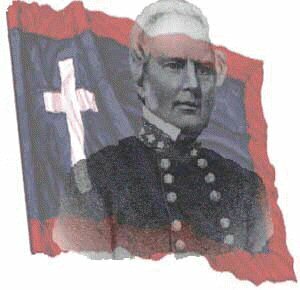 Minor Meriwether was one of the few men who had faced down General Forrest, and lived to tell about it. Had this occurred during the war he might not have been so lucky. The roadbed was later upgraded and approved. For his act of bravado, Meriwether and Forrest were good friends thereafter. Lee Meriwether inherited his father’s cavalier spirit. He lived to be 104 years old, and saw the many changes that the 20th Century brought. He wandered Europe for several years, gathering research for his many books. (He wrote a total of 14) In 1901 he ran for mayor of St. Louis and won...only to have the corrupt political machine rig the vote count. The St. Louis Republic Newspaper was a part of the political machine, and wrote a scathing article against Meriwether. He sued the paper for $20,000 and won, using the proceeds to purchase rental property that provided a handsome return for the rest of his life. Compatriot I. A. Long was another fascinating member, who though never serving as Commander, indicates the sort of folks who were attracted to our organization. After being turned down for a loan, he decided to start his own bank. As the founder of Southwest Bank he became one of the most prominent members of St. Louis society, and the owner of one of the most successful banks in the State. While serving as Police Commissioner, he got a call that his bank was being robbed. Gathering up all the available police, Long led the charge and captured the robbers. Some years later Hollywood made a movie of his escapade. “The Great St. Louis Bank Robbery”, starred Steve McQueen. William Crowdus, Camp commander in 1955 was serving as President of the Jefferson National Expansion Memorial Association, when the Arch was built. Colonel Francis Marion Curlee, Commander in 1914, owned Curlee Clothing Company. One of the largest clothing manufacturers in St. Louis at the time. Their company was on Washington Aveenue, and dominated the city’s garment district. Curlee was eventually to own the Daniel boone Home in Defiance, Missouri, and is credited with preserving this precious shrine to one of our most famous citizens. Walter Naylor Davis, was the son of Judge Alexander Davis, a Confederate soldier who after being captured exiled himself to the mining camps of Montana. He became the “Judge Roy Bean” of Montana, and with the help of several vigilante groups, cleaned up the denizens of the wild miners camps. Colonel Daniel Hundley, Camp Commander in 1967, served on General MacArthurs staff during World War Two, and was awarded the Distinguished Service Medal, the Legion of Merit, The Order of the British Empire, the French Legion of Honor, the Belgian Order of Leopold, and the Dutch Order of Orange Nassau. When he retired from the military he taught Engineering and Mathematics at Washington University. Richard McCulloch, Camp commander in 1918, was President of United Railways of St. Louis from 1914 til 1922. United Railways owned the St. Louis Street Car System. He later served as Director of Union Electric, and inherited a $54,000,000 estate during the depression. Joseph Mullen, Camp Commander in 1926, was the president of Olin-Mathieson Chemical company. His daughter married Lieutenant General “Hap” Arnold. “Pat” O’Connor was an infantry officer in World War Two. He fought at the Battle of the Buldge, and was awarded the Cross of War by both Belgium and France. Commander Thomas Julian Skinker designed and built the Chain of Rocks water pumping station in the 1940's. It is still in use 60 years later. These are but a few of our past Commanders who represent the outstanding characteristics, and talents that have created the legacy of Sterling Price Camp. As of July 1999 we have a very strong organization of more than 100 members, and the future of the Camp looks better than it ever has in the past. Membership and retention are on the raise, and new members are coming in on a regular basis. The vast majority of our members have been with the SCV for 10 or more years, and we have a dedicated core of vigorous constituents. The Camp is closely involved with the Missouri Historical Society, the St. Louis County Library, and the St. Louis Genealogical Society. We have regular monthly meetings at Spiro’s Restaurant on Woods Mill road at Olive, and the congenial atmosphere, excellent cuisine, and comradery have made the meetings, once more, a delight to attend. In the summer of 1998, Compatriot Scott Williams moved the Camp closer to the 21st Century with the inauguration of the (now famous) Sterling Price camp Web Site. (www.sterlingprice145.com ) With the introduction of this world renowned communications tool, we can see the expanding future of our Camp laid out before us. Never before has word of the Confederate Cause reached so many people. Accolades have been received from around the world, and from many institutions of higher learning, concerning the excellent content of this web site. The repression of Confederate ideology and symbols will probably continue, and may worsen in the future. Our task of vindicating the cause of our Confederate ancestors was never deemed to be an easy one, and the real test of our commitment lies before us. Future social trends are impossible to predict, but they rarely improve without encouragement in that direction by vigorous public sentiment. Our responsibility of educating the youth of America can not be over emphasized. Mis-guided, “neo-reconstructionist” educational experiments have left a vacuum that may be filled by either good or evil. Anti-Southern bigots, who have glamorized evil in print and media, must be exposed for what they are.....traitors. Our purpose is to insure that good Southern traditional values are preserved and in the youth of America. Our posterity must believe in themselves, and their proud Southern heritage. 100th Year Anniversary Cake. Reproduction United Confederate Veterans Lapel Pins were made available as a keepsake. Festivities were held at the Westport Sheraton Mariott Hotel in St. Louis County, Missouri. 1990- Hardy, Patrick J. M.D.